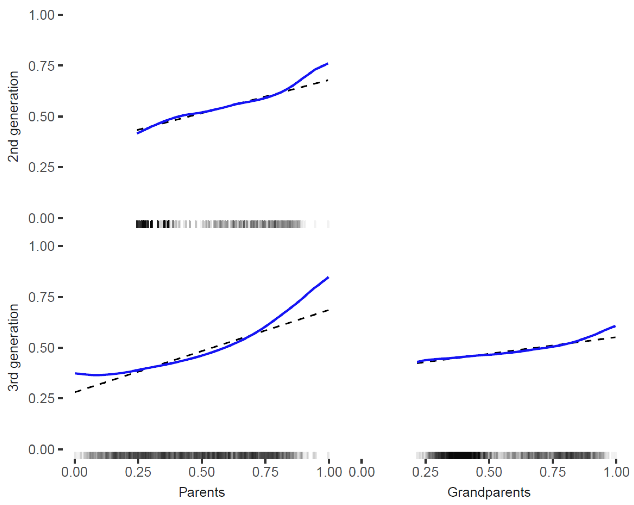 Note: Horizontal axis shows relative wealth (percentile ranked) for the ancestral generation, and vertical axis shows relative wealth for the child generation. Blue lines show nonparametric regression fits, and dashed black lines show linear regression fits. Vertical lines along the horizontal axis show the distribution of observations. Note: Horizontal axis shows relative wealth (percentile ranked) for the parental (first) generation, and vertical axis shows relative wealth for the child (second) generation. 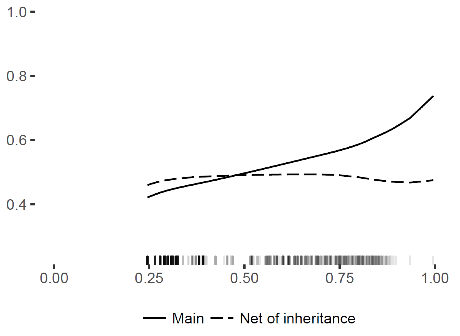 Solid line show nonparametric regression fits, and dashed black line show the corresponding fit when child wealth has been purged of inheritance. Vertical lines along the horizontal axis show the distribution of observations. Adermon, A, M Lindahl, and D Waldenström (2016), “Intergenerational wealth mobility and the role of inheritance: Evidence from multiple generations”, CEPR Discussion Paper No. DP11456.